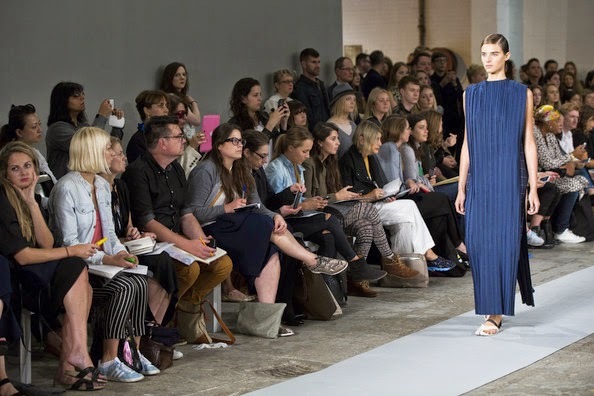 Paula Gerbase's label 1205 is at the forefront of understated simplicity in London. Every season the Brazilian-born London-based designer perfects her Saville Row trained precision tailoring. Fans of elegant and easily wearable clothing will be a huge fan of this collection and the label. 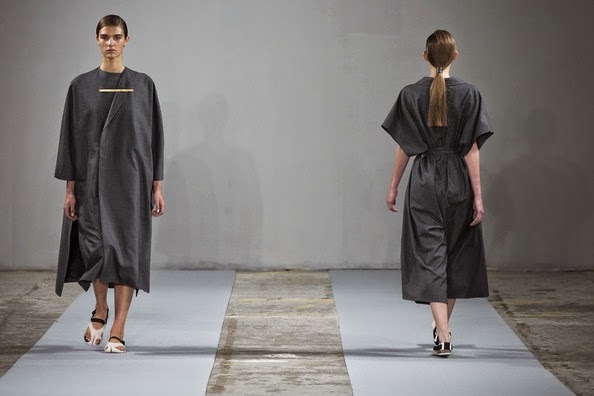 Navy, grey, khaki green, black and white were the only colours on Gerbase's palette for her Spring 2015 show. 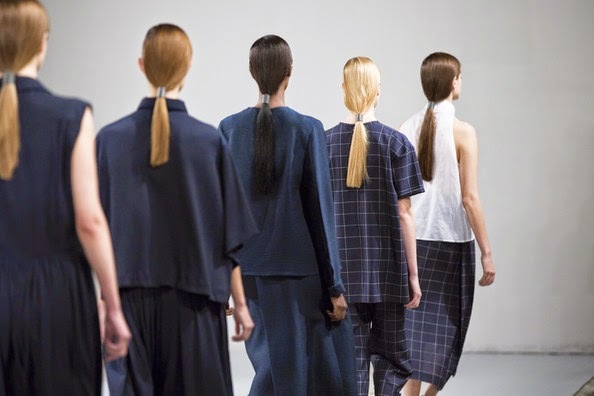 Look 27 was a white halter neck loose top tucked into navy knife pleated trousers. The following look, the finale look, was the a navy knife pleated dress which looked a tad shapeless. Upon closer inspection, a form fitting dress was underneath. The knife pleated part of the dress became more intriguing after this discovery. Gerbase has many high profile stockists. Browns, Harvey Nichols and Dover Street Market all stock her clothes in their stores. She has over 21 stockists in Japan, excluding the countless amount elsewhere. Online powerhouse Net-a-Porter also sell 1205. The label clearly appeals to the masses and it is clear to see why. The refined elegance with a touch of edginess in the clothing are perfect for the international and national markets. There is always something for everyone in each 1205 collection. A lot of designers at London Fashion Week are eclectic. Gerbase doesn't fit into that category. She designs beautiful monochromatic easy pieces with an occasional quirky twist that will be coveted by women who value classy workwear items that can be transformed from day pieces to evening wear. The clothes were versatile and the show was enjoyable.